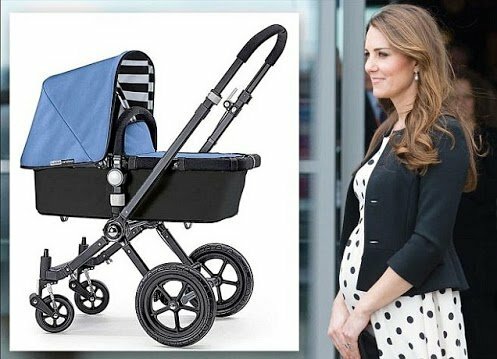 Six months pregnant Kate Middleton is said to have told a group of Army wives at a recent drinks reception in Aldershot that she has bought a Bugaboo pram in light blue, which some have taken as a clue to her unborn baby’s gender. It’s been quite a week for Kate Middleton’s baby shopping: not only has she bought her pram, but she’s also chosen a white wicker Moses basket, which she purchased with her mother Carole from luxurious nursery furniture shop Blue Almonds, in South Kensington. Made by a Dutch company, the Bugaboo quickly became a status symbol for yummy mummies, and, despite a price roughly the same as a small family car, they became a common sight on the streets of Notting Hill and Chelsea. The top-of-the-range model comes in at just over $1,900. Popular models such as the Bugaboo Cameleon, which starts at $1,250, even hold their value second-hand. “A pushchair is no longer something you use to push a child from A to B,” said Jo Studholme, who runs online magazine Pushchair Trader. While stores such as Mothercare and John Lewis still have a good selection of own-brand prams at the far more reasonable $390, it’s the designer brands that make most money. Even without Kate Middleton’s endorsement, the rise of the Bugaboo has been meteoric. What started out as Dutchman Max Barenbrug’s graduation project at design school in 1994 has turned into a global business. With two daughters, Max Barenburg wanted to come up with a pram that men and women would be happy to push. Bugaboo employs 800 staff and sells its products in more than 50 countries. The company’s annual revenue has grown from $2.8 million in 2001 to $97 million at the last count. While sales are undoubtedly boosted by celebrity endorsement, chief marketing officer Madeleen Klaasen insists that quality is the true benchmark of the brand. “If your product doesn’t perform, you’re gone after the first-year hype,” she says. Bugaboo fans insist the pram is well-designed and therefore well worth the price-tag – even though it seems to be universally acknowledged that it doesn’t fit into the boot of a small car and is pretty difficult to work out how to open and collapse them. There are several YouTube videos attempting to show Bugaboo virgins how to fold and unfold them. “There was a big buzz about which buggy Kate would go for,” says Jo Studholme. “I think there will be some disappointed manufacturers out there.